Right now the world needs more love. I believe that in order to give love to others we first must feel love ourselves – remind ourselves what we love and what brings us joy. This thought was on my mind when I created this art journal spread yesterday, from a lesson in Effy Wild’s “Book of Days” . Recently Effy posted about “flinging glitter” –doing things that you love and that bring you joy especially when the world is in chaos or our lives are difficult. Effy’s post reminded me of a journal exercise I read about and did long ago – write down 100 things you love, that bring you joy. It’s easy at first, but then you have to really think about what else to add to the list. I found my old journal – I made my list back in 1998, when our first child was 2 and I was a stay-at-home mother living in a new city. I think it’s time I made a new list. Many things from the old list are still things that bring me joy, like #16 walking along a sandy beach, #25 baked potatoes with butter and salt, and #71 taking art classes. But I am going to create a new list without looking at the old one, and see what brings me joy today. What are 100 things that YOU love? This summer I saw a post by Balzer Designs lace pages about something she called “cutting lace pages”. This technique is also called papercutting. Julie Fei-Fan Balzer has a video demonstration on her page, and I liked her no-plan, abstract design approach. I really liked the final effect, and it looked fairly easy, so I decided to try it. For my first one I used an index card to test the process, and because I was doing Daisy Yellow’s “Index card a day” summer challenge. I had a crappy craft knife and dollar store cutting mat, but was really happy with the result. More recently I went and bought an x-acto knife and real cutting mat from a craft store. I made the second one (at the top of my post) on a piece of watercolour paper, and tipped it into my art journal, so that a gorgeous background I made from one of Effy Wild‘s tutorials in her “Book of Days” class would show through. I keep thinking I should add some words onto the background page to show through the gaps, but I haven’t found the right ones yet. This is definitely a fun art journal technique that I will use again. I feel a bit like I am in the eye of the storm. I’m not calm in the eye, I am stuck there while “things” swirl around me. First, Tuesday was my first day back at work in four months. Traffic is nuts – schools and Universities just started. One of the classes I teach is at 8:30 AM, so I need to leave by 7:15 to make sure I get here in time. Parking at work is crazy (and over-sold)…so I left early today too. I had forgotten how difficult it is to work here – not the students or the teaching, but there is a cloud of negativity here. It is not a happy workplace. Plus, as a part-time contact worker I share an office space with several other people, who are nice, but there is constant coming and going of people plus people talking and just the fact that I am an introvert and here at work I am never alone. Except for right now. It’s 8 AM and I am the first one here. 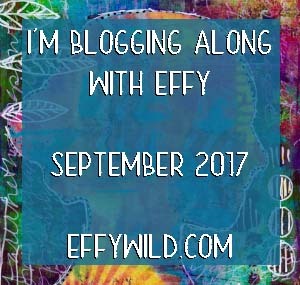 Second, I have missed two days of the blog along with Effy challenge, and I feel like I have “failed” the challenge. I KNOW intellectually that it’s fine. But I feel like I have failed myself. Yesterday evening, after a tiring day, I was composing a post when my laptop froze and I lost it. At that point I gave up, made dinner, and watched Star Trek DS9 with my spouse and kid. Third, Hurricane Irma is devastating the Caribbean. This impacts me personally because my spouse and I just returned from a trip to Jamaica a week and a half ago, I lived in Barbados for 12 years, I have Facebook friends in the Caribbean, and my dad still lives in Barbados. Luckily Barbados was spared (my dad’s words). And now there’s Hurricane José, predicted to follow a similar path to Irma. I have been feeling stressed and overwhelmed and a bit defeated. I had so many plans for how I would blog, and work, and do art, and get to yoga, and maybe re-join Toastmasters, but I am having trouble believing that I can fit it all in. BUT – this morning I got up and did my morning journaling, read an article in “Live Happy” magazine about setting an intention for the day, resolved to pick myself up, sang loudly in my car on the drive in to work, and wrote this blog entry. I plan to leave by 3 PM, go home and do some kind of art. (One advantage of my position is that I don’t have set hours that I have to be in my office, I just need to get my work done). I will re-focus and work on a plan to do the things, like art and yoga that are important to me. I will be gentle with myself as I adjust to my return to work and develop a new schedule. Onward and upward. Because I work at a university, September marks the start of a new academic year, and is another time in which I assess the goals and plans set back in January, and tweak them or set new goals and intentions. This morning I read a blogpost by Zoe Gregg AKA Aisling Beatha (http://ukzoe.blogspot.ca/2017/09/what-do-you-no-longer-believe-effys.html) about her 5 mottoes – which reminded me to think about my words for 2016. I set these last December as a guide, an intention for how I wanted to approach my life in 2016: my work, art practice, and home life. I used a process developed by Susannah Conway http://www.susannahconway.com/word/ to help find your word of the year. I did this in 2016 as well, and intend to do it again for 2018. For 2017 I ended up with 2 words: a feeling word, radiant, and a doing word, flow. Radiant means “sending out light, shining or glowing brightly” – for me it connects to being positive, joyful, energetic, enthusiastic, and passionate. Flow means to “move along steadily and continuously; proceed or be produced smoothly, continuously, effortlessly” – and for me invokes moving forward, being engaged & focused. When I reflect on these two words they remind me of how I want this semester to proceed, at work, art-wise, and at home. I need to stay focused and positive at work, and make time for the things in my life that bring me joy and keep me balanced. Yesterday and today I worked on a bonus art lesson from Effy Wild’s (effywild.com) online Book of Days 2017 class. I stayed fairly close to what Effy demonstrated in her video. I need to just create something without any pressure, to soothe myself and relax a bit before I go back to work. I have been off (not teaching) since the end of April, so this will be a bit of a re-adjustment to schedules, traffic, and interacting with more people. The art journal spread was done by first creating a background with several layers of acrylic paint. Then I added the face and plant shapes, fiddled for a while with shading, outlining etc, and finally added the text. The words I chose reflect my mood while I was creating. When I make these mixed media spreads I often add a sentiment that is a message or reminder to myself. I have been taking mixed media art classes for about two years now, several with Effy Wild, plus a few with other artists like Tamara Laporte (https://www.willowing.org/), and Tammy Garcia (https://daisyyellowart.com/). Here is the first face I painted from an Effy Wild lesson, back in September 2015 for a class called “Facing Forward”. At the beginning every lesson I did had new techniques to learn, and new media I had never used, and I followed every step in the lesson as closely as possible, even the colour palettes. Two years later I have learned SO MUCH. Now I am much more confident and comfortable making art, and am finally starting to alter the lessons to suit myself. What DO I really want? I want to keep working part-time, not full time. I wish hat I did was more certain and dependable – I don’t like the stress of not knowing if I’ll have a contract next semester or next year, but I do like the flexibility, and I like teaching and interacting with the students. I want to keep doing art. I want to practise and improve. I am a much happier person when I spend time each week being creative – my spouse can verify that. I don’t know if this will lead anywhere, and that’s not the point. I just know I need to express myself and it brings me joy. I want to do more of all the things I love: music, art, yoga, writing, reading, and cooking delicious food. I want to make time for my relationships with my spouse and children. And I want to be around positive, supportive people more often, and interact with negative people less often. What I most want is for my life to feel unified. In the past, I have mostly kept the two “halves” of me (science prof/artist) separate. This goes back to childhood experiences (“our family are not artistic”), and the attitude that scientists/academics should be all-consumed by their one field of study, and by my own self-doubts and feeling that “real” artists will dismiss if they find out I have a PhD in Biology. So I keep science me and artistic me separate. But they are both equal aspects of me and the way I see and interact with the world. Author eastcoastravenPosted on September 2, 2017 Categories Other stuff4 Comments on What do I really want? Here I am, on the precipice of a new University semester. In a few days my life is going to get VERY busy. I am trying not to get overwhelmed by all the things to do. I am working on getting my courses ready for next week, when classes begin. One is a course I have taught many times before, the other is a brand new (to me) first year course which has (as of today) 118 students. The largest class I have taught in the past was around 40 students, so I am a little nervous about the new one, but I have adjusted the way I will test and teach, so I’m sure it will be fine. Every new group of students is different, even in courses I have taught before. The dynamics are different, some things “work” better with some groups than others. So, it is impossible to ever be fully prepared, and I know I will need to adjust things as I go along. east coast raven A WordPress.com Website.